The first company provides credit card acceptance services to merchants. There is a high probability that you use their services when you buy something on the internet or pay a hotel bill. They have had a highly effective Sales Training Leader in the Senior Management Team for some years now and I think they are one of the companies that make the most of the trainings we deliver. They analyse the results after every course over time and make sure they get a return on their investment. So when they said they were going to hire senior people with the sole remit of coaching Sales People who had already participated in a course I thought it was an excellent idea. The second company is a supplier of maintenance services to the mining industry. They are facing huge challenges with a global downturn in the mining industry so they have to look at other sectors like ports, civil engineering and waste disposal where they can sell their services. Is their Sales Manager a bad Coach? I don’t think so. Like every other Sales Manager, he works long hours and probably has 8-10 number 1 priorities. His performance is judged by his end of month figures so he has to concentrate on opportunities that are already in the pipeline. He certainly doesn’t have a lot of time to coach the Sales People who return from our courses to help them change the way they are working. When we finish a Sales Training the vast majority of the participants tell us how much they enjoyed it and how they are going to implement it when they get back to work. We often receive Emails from Sales Managers with statements like: “The feedback was very positive and there is a strong desire to live and breathe the sales process and tools. I will make sure that the concepts are applied in daily business”. But depending on how large the gap is between current and required capabilities we know that positive workshop feedback is not sufficient to achieve real change. The first follow up after a training is usually great because everyone is still full of enthusiasm and results may have already improved. But all too often after a few months or a year things have gone back to the way they were before the training. A very astute Sales Person from the mining services company I referred to above compared this with planning to have friends round for dinner on Saturday and buying the fresh ingredients on Monday knowing you didn’t have a fridge to keep them in! Organisations have to think of the sort of training we deliver as a first payment with the real investment being made over the following months and years. I have already talked about the importance of getting the tools and technology right in an earlier blog. I would say that 10-15% of the effort that needs to be invested in a Sales Transformation has to do with training, the other 85-90% is about coaching. I mentioned my other conversation earlier with the payment transaction services company. They are going to hire Sales Performance Coaches whose role will be to coach the Sales Team and make sure their way of selling becomes a competitive strength. I agree this is quite a radical approach but they have seen the potential benefits of change and they want to make sure it sticks. I am quite sure they will have done the maths and created a sound business case. You don’t have to hire in staff or consultants to do the coaching but you do have make the time available for the people who do the coaching. The amount of time required depends on the number of people in the team and the size of the gap between current practice and where you need to be. As a guideline I would say 50% of a Sales Manager’s working week is required to make the changes stick. How many Sales Managers feel able to put aside half their current time for 6-12 months? What exactly do I mean by coaching? It’s a matter of introducing all the tools and practices of the new Sales Process into the day-to-day functioning of everyone in the Sales Team. The most useful interventions in terms of coaching are preparing Customer Meetings and conducting Opportunity Reviews. This should be the Sales Manager’s role but it is possible to devolve a lot of coaching to someone else with significant Sales and facilitation skills. The amount of coaching required is often underestimated. For instance, the mining services company is moving from established customers in a sector they know well to winning new customers in new sectors. Approaching and winning customers in a new sector requires a different skill set than servicing existing customers. If you are going to take your Sales Team away from selling for several days that is a really significant investment. The preparation for a course also involves a lot of time from the Sales Manager and of course there is the cost for trainers, venue etc. It all adds up. Surely it makes sense to make the rest of the investment that ensures you actually achieve the desired results? 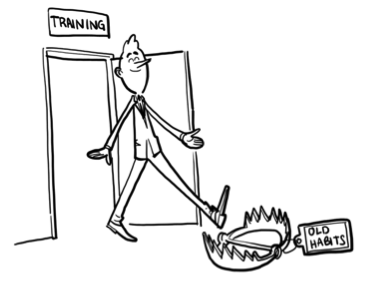 Do you achieve tangible and sustained results from your sales trainings? Do you plan for ongoing investment after a sales training to make sure that it sticks? Are your Sales Managers already pretty busy?